A dog's hyperactivity may be related to diet. A hyperactive pooch can be tiring for everyone in the house, except for maybe the pooch himself. Fortunately, for most overactive dogs, some simple changes to diet and exercise can make life much more calm. The first step in calming your canine companion is to check the ingredient list on his food. Many inexpensive dog foods are filled with sugar, salt, by-products and artificial ingredients. These cheap "junk" foods can have the same effect on dogs that they have on children, often making them hyperactive, jittery and anxious. Look for foods with no by-products, sugar, salt or artificial colors and flavors. Sometimes, a simple change to a more natural food can help with hyperactive behaviors. Your hyper pup may have an allergy to a particular protein, grain or other ingredient, the allergic reaction can sometimes look like hyperactivity. If changing to a more natural diet doesn't seem to help, look for a limited ingredient diet that has a unique protein your dog has never had before. Venison, buffalo and turkey are good choices. Try to find a food with no grains and limited other ingredients to try to rule out a food allergy. Your pooch's hyperactive behavior may be the result of too much of a good thing. Dogs turn protein into energy. If your dog's food has a high level of protein, his hyper behavior may be an attempt to use up all of that energy. Dog foods with high protein levels usually are made for dogs who spend a good bit of the day in motion running, working or playing. Don't feed your dog below the Association of American Feed Control Officials guidelines unless directed by your veterinarian, but a small decrease in protein may lower your dog's activity level. 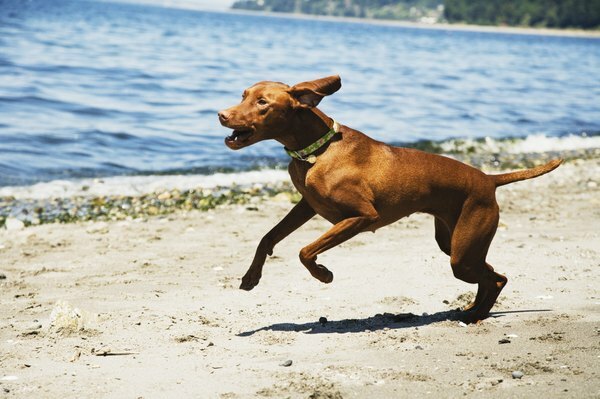 Your dog's hyperactivity may not be related to his food at all. If you have a dog bred for a job, you may need to change his exercise and not his diet. Herding and retrieving dogs are designed to spend hours every day working. Most of our family pets don't get the level of exercise they originally were bred to get. Consider training your pup for agility, Frisbee or herding competitions to help burn up some of that innate energy. Doggy day cares and daily dog walkers also can help get your pooch the exercise he needs. A doggy version of ADHD, attention deficit hyperactivity disorder, called hyperkinesis does exist. According to veterinarian Karen Becker, hyperkinesis is rare but can be diagnosed by an experienced veterinarian. In these cases, medication can help calm your pup. Some dogs with thyroid issues also may be hyperactive. Luckily, a simple blood test can determine if this is the problem and medication can be effective. So, if diet changes and exercise don't solve your pup's hyperactivity, a trip to the vet is in order.